Yes, but where’s it going to end up? We’ve got a web tool to help you. 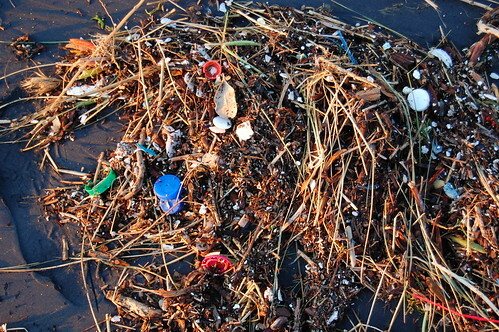 Ocean plastic photo by Kevin Krejci on Flickr. A selection of 10 links for you. Contains choking parts. I’m charlesarthur on Twitter. Observations and links welcome. Q What do you hope to do for Google in the long run? I’m really excited about the potential for general AI. Things like AI-assisted science. In science, almost all the areas we would like to make more advances in—disease, climate, energy, you could even include macroeconomics— are all questions of massive information, almost ridiculous amounts. How can human scientists navigate and find the insights in all of that data? It’s very hard not just for a single scientist, but even a team of very smart scientists. We’re going to need machine learning and artificial intelligence to help us find insights and breakthroughs in those areas, so we actually really understand what these incredibly complex systems are doing. I hope we will be linking into various efforts at Google that are looking at these things, like Calico or Life Sciences. It sounds a lot more ambitious than his initial aims, which are to help in search and Google+. (G+? Really?) Disappointing that the names of the people on the AI ethics panel aren’t being announced. Would also like to know his opinion of Ex Machina, which is released this Friday. If you’re feeling bummed out about how nearly impossible it is to pick up a Nexus 6 right now, the good news? You may have dodged a bullet. We’ve been receiving reports of defective [Motorola-made] Nexus 6 units being shipped to customers where the back covers are literally coming off. #backgate? #gluegate? Apparently the Moto 360’s back sometimes cracks too. All in the Motorola family. Since this was a laptop for my son, I did like Microsoft’s Family Safety feature, which allowed me to set up his computer with a child’s account and track the websites he visited and how many hours he was using each application. OS X has a similar feature that lets you access parental controls on your child’s computer from your own, but Microsoft provides a web interface and sends a weekly email summary. Family Safety actually helped me realize that some kind of adware was installed on the machine, forcing every bit of web traffic to make a call to an ad site. This either came installed on the machine or my son broke the record for getting infected, as the report indicated it was accessed from day one. And that’s the thing about the standard PC user experience. Between the adware and crapware that’s preinstalled it’s hard to figure out what’s actually malware. Microsoft has tried to help by selling computers through its own stores that are bloatware-free and by allowing OEM customers to make clean Windows installs for a nominal fee. I expected a “hockey stick” curve that’s characteristic of power law models, but I didn’t expect one like this. The hockey stick breaks upwards at around position 870 on the US Top Grossing list. With about 1.2 million apps in the App Store at the time the data was collected, that arguably puts 99.93% of apps in the “long tail” of the App Store. 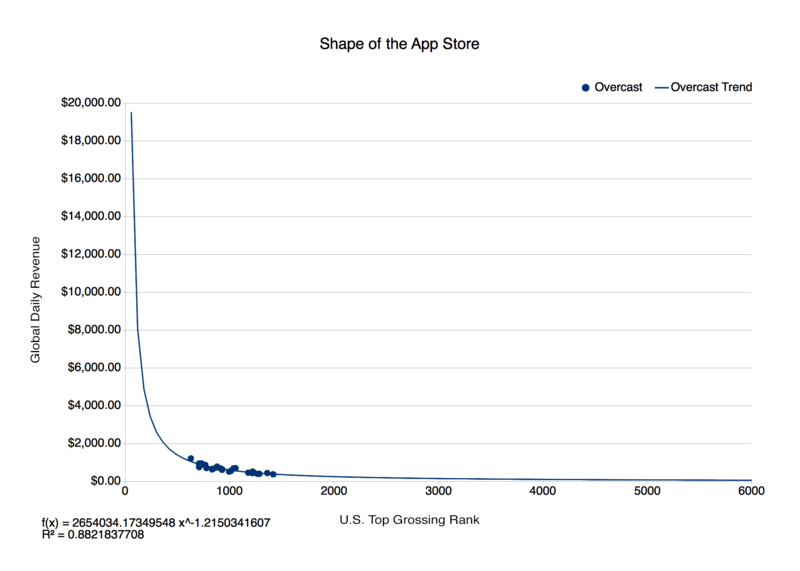 The “head” of the App Store, those 870 top grossing apps that make up 0.07% of the App Store population, collect over 40% of the App Store revenue that’s paid out. Luckily, there’s a lot of money to be made in that long tail. At the top of the long tail, in position 871 on the US Top Grossing list, an app still makes over $700 in revenue per day. That’s almost $260,000 per year. Even number 1,908 on the US Top Grossing list makes over $100,000 per year. In fact all apps above number 3,175 on the US Top Grossing list produce enough revenue to at least make its developer the United States household median income for 2014 ($53,891). Surprising (as in big). I’d like him to take the data that has been released by UsTwo for Monument Valley, and also for Unread, and see how well his curve fits. He has posted a followup with data from Manual, a camera app. It still looks much the same. Cohesive design, “Continuum” (which seems to be about understanding whether it’s being used in tablet or desktop mode), new web browser, Cortana (the voice-driven assistant thing), Windows 10 on Windows Phone, and a release date. Will sell well. Won’t mean a thing for mobile, which is where the action (and money) is. Event starts 0900 PDT, 1200 EST, 1700 GMT, and should be live-streamed. If you know in advance that you might be targeted, there are measures you can take to improve your anonymity, but oftentimes there’s nothing at all that can be done, especially if you conduct your business on the internet. Raiders often use this as justification for their activities: if you didn’t want your entire life collated and archived, why did you post any of that online in the first place? It’s a disingenuous argument, however, because they aren’t concerned about accuracy. If your doxx happens to have inaccurate information, who cares? False claims can prompt a correction that reveals more clues to add to the doxx, or just a entertainingly outraged response from a target. Obviously, it shouldn’t ever be the posters’ details that are made public, or their internet lives that are rendered useless. Because.. well, anyway. According to Microsoft OEM pricing information – a screen capture of which is embedded above in this post – Windows 8.1 with Bing is listed at $10 per copy for Intel-based tablets under 9in in screen size. But after a “configuration discount,” of $10, OEMs get that SKU for those tablets for free. For tablets with screen sizes of greater than or equal to 10.1in, the Windows 8.1 with Bing SKU is listed at $25 per copy, with the same $10 “configuration discount,” resulting in a $15 per copy cost for OEMs. There’s another related SKU that is also meant to help stimulate the market for mobile devices running Windows. The “Windows 8.1 with Bing and Office 365 Personal” is another low-price SKU available to OEMs. Like the Windows with Bing SKU, this one also requires OEMs to set Bing search and MSN.com as the defaults (changeable by users) on new PCs. This SKU also includes a free, 12-month subscription to Office 365 Personal. Still not cheaper than Android, and Intel chips are going to be pricier (because Intel is dropping its subsidies), which continues to make small Windows tablets a very hard sell. the link between Google and PCs/laptops is a very strong one; engagement rates by device show that the vast majority of PC and laptop users are visiting Google on a monthly basis, whereas the equivalent figure among mobile Internet users is just 50%. And even on tablets, where the experience is closer to a PC, it’s only 57% who are visiting Google. As we have stressed, PCs and laptops are not being abandoned. But it is clear — and abundantly so – that mobile is capturing a progressively bigger share of Internet time and traffic, especially in fast-growth markets. Of course, most Web brands would pay a handsome premium to have a 50% reach among mobile Internet users. Seen in this light, these numbers are still pretty solid for Google. But that there is such a gap between the brand’s usage on different devices is a clear sign of the fundamental changes to web behaviours that the rise of the mobile Internet is causing. Brightness (or luminance) is measured in ‘nits’. Hunt explained that most TVs today have a peak brightness of around 100 nits, whereas the peak brightness of an HDR television is around 1,000 nits – representing a 10-fold increase in the brightness of the highlights on the screen. This is still nowhere near the brightness of the sun reflecting of a white wall, for example, which is around 10,000 nits. However, it is a substantial improvement compared to current TVs, and delivers a more realistic and engaging picture. “Bright white clouds still have texture on an HDR screen instead of just being a washed out white patch. More importantly you end up with reflections from water and metal and glass being very bright, and representing the shape and colour of the reflection even more accurately than previously possible,” said Hunt. More nits require more bandwidth, but Hunt said that delivering an HDR picture only requires about 20% more bits than the equivalent resolution. So 4K is normally delivered in about 15Mbps, while 4K HDR requires 18Mbps; 2K is delivered in 5-6Mbps, while 2K HDR requires 8Mbps. Ooh, I’ll have the 2K HDR. You can’t tell 4K anyhow unless your TV’s the size of a house. Want to know where your message in a bottle will turn up or track down the path of local floating pollution? Welcome to adrift, a website inspired by research into ocean circulation by Dr Erik Van Sebille and the delightful book Moby Duck about the true adventure of 28,800 rubber ducks lost at sea. Here you can explore how all kinds of objects drift through the ocean – from rubber duckies to plastic pollution – and where each object might end up if it is washed out to sea from your beach. The website uses a scientific method that is based on observed tracks revealed by buoys in the Global Drifter Program and other scientific research in this field. On this website you can see where ocean-going debris travelled after the Fukushima disaster or the path rubber ducks may have taken after the famous Friendly Floaties spill revealed in Moby Duck. Say goodbye to your lunch hour.